By Dan Ambrose: WBC middleweight champion Julio Cesar Chavez Jr. (46-0-1, 32 KO’s) will be looking to keep his unbeaten record perfect when he defends his WBC title against former WBC champ Sergio Martinez on September 15th in Las Vegas, Nevada. Chavez Jr, 26, is following in his father’s footsteps in building up a huge unbeaten record, albeit with many of the opponents not exactly the strong variety. Talk about putting pressure on yourself. Couldn’t Chavez Jr. just focus on winning the fight for himself rather than trying to add his country behind it. He could be in for a big letdown if things don’t work out well for him. He’s already an underdog in this fight, and I think he may be a little too confident due to all the soft touches that his promoter Bob Arum has put in with him. Chavez Jr. really hasn’t faced anyone all that great. He beat Sebastian Zbik, a decent fighter, but took a ton of punishment in this fight in winning. A lot of boxing fans felt that Chavez Jr. should have lost that fight or at least it been ruled a draw. That fight and Chavez Jr’s recent fights against Andy Lee, Peter Manfredo Jr., Marco Antonio Rubio, have been fights where Chavez Jr. won more on size than having the better skills. I mean, he won on weight by being the heavier guy. If Chavez Jr. tries to walk Martinez down and use pressure and size to beat him like he’s done with other opponents it might not work with the results that he’d had in past fights. Chavez Jr. was able to walk through shots in past fights, but I think he won’t be able to walk through Martinez’s punches. 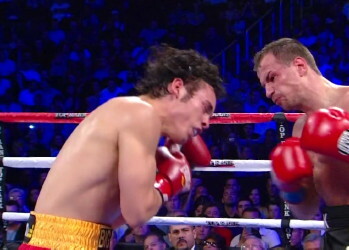 He hits too hard and Chavez Jr. will be wide open for everything he throws. Martinez hasn’t faced guys that lead with their head like Chavez Jr, and it’s going to be easy for Martinez.